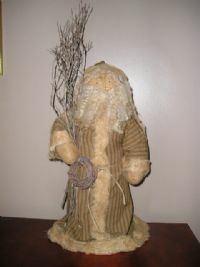 This santa is wearing an aged red flannel coat and has a hood. He has a grungy beard which gives him a more old aged prim look. 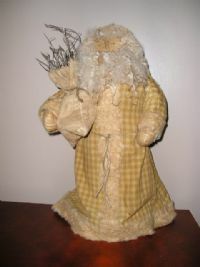 Weighed to stand about 13"
This santa hangs and is wearing an aged red flannel suit an cap. Batting around his waist. stick hands and legs. about 9"
This santa is just perfect for the holidays. He is wearing an aged mustard check coat and hood. Stands 20" tall.